Only one routine but what an effect - and completely self working! This must be one of the strongest self-working effects there is. Based on the Eddie Joseph principle “Staggered” you have here a unique, fantastic routine in five phases, one stronger than the other where the cards match even though everything appears controlled by the spectator. The finale is a ‘staggering’ match of all the cards! You will have fun learning it and you will make a reputation out of this routine. Uses any deck of cards. 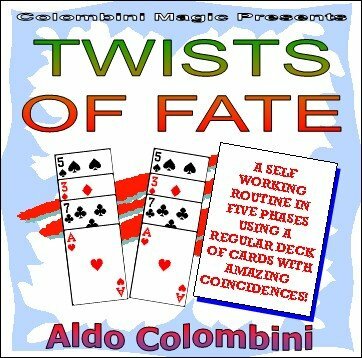 It is quite an achievement for Aldo to take a strong effect and make it even stronger by streamlining it and forming it into a much faster paced miracle. It is also modular. You don't have to do all the phases.